Well, another birthday has come and gone! For MyPlate that is! It’s hard to believe that it’s been two years since the USDA rocked our world by introducing the new MyPlate icon along with the 2010 Dietary Guidelines for Americans. At that very moment, we scrapped everything we knew in the MyPyramid; everything that was familiar. Here at NCES, we threw out any products that depicted the ‘dated’ MyPyramid image and began recreating our awesome educational handouts to include the all-new MyPlate. Since then, we’ve added many new products to the line, including the NCES MyPlate Food Model Kit, NCES Right-Sized plates for portion control and much more. 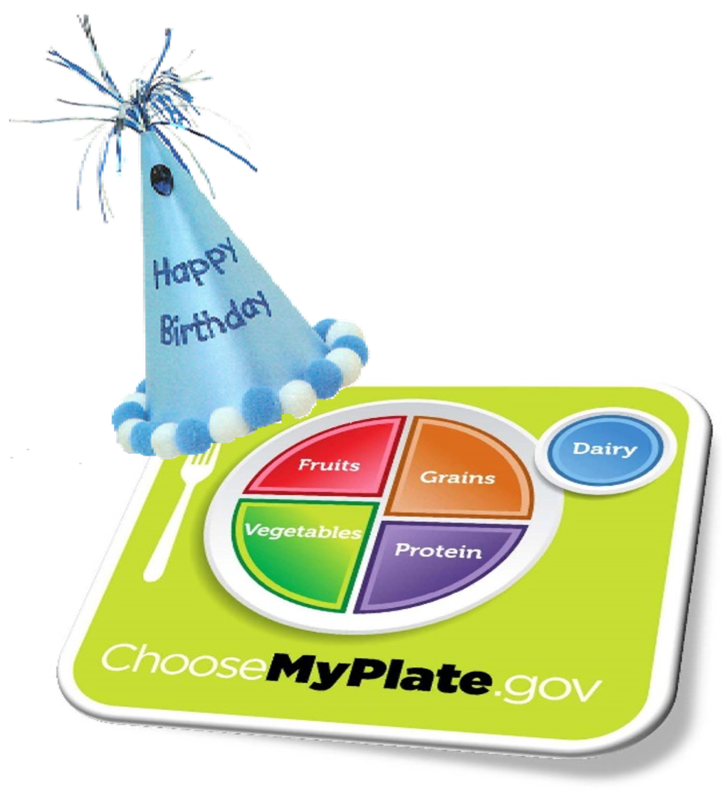 So, even though MyPlate’s actual birthday has come and gone (June 2nd), we’re going to continue celebrating all week! How can you join the celebration? It’s simple! Head on over to Facebook and be sure to like NCES and MyPlate. As many of you know, NCES was among the first to release a brand new line of MyPlate products. You can always count on us to provide you with the most up-to-date information. Our Facebook page is the best way to stay on top of everything health and nutrition! Plus, just because we really want you to join us on Facebook, there’s an exciting savings code waiting for you on our Facebook page! So, be sure to like the page while you’re there so you’re always the first to receive our money-saving offers! As with everything, the nutrition industry is constantly changing. With our highly skilled staff, including our favorite on-staff dietitian Carrie, we make sure to stay on top of nutrition trends and work to provide you with the most up-to-date, trusted information and resources. Be sure to join us Facebook, Twitter and LinkedIn to be the first to know of breaking nutrition news!